Every once in a while, I get surprised by an article in Arabic media. This is one of those times. 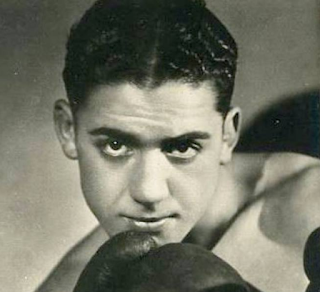 Al Arabiya has a profile of Victor "Young" Perez, a Jewish Tunisian boxing champion murdered by the Nazis. About 100,000 Tunisian Jews were forced to wear a yellow star during the Second World War, and thousands were sent to labor and concentration camps, where many were killed. One such victim was Victor "Young" Perez, one of the most prominent athletes to grow up in the Tunisian Jewish community. Victor Perez was born on October 18, 1912 in French-ruled Tunisia. His father -- Khmaïssa, a household goods salesman – and mother, Rene, raised Victor and his four brothers. Perez began training as a boxer together with his older brother Benjamin at the local "Maccabi" club. He idolized Battling Siki, an American-Senegalese light heavyweight champion, who was murdered in 1925. Perez won his first match when he was 16. He left Tunis for France in order to compete in the flyweight category and won the French flyweight title in 1930. On October 24, 1931, only days after turning 19, Perez was crowned world flyweight champion after defeating the American Frankie Genaro. Perez thus became the youngest world champion in history. He also caught the attention of gossip columns for his relationship with the French-Italian actress Mireille Balin. Victor Perez's career continued until December 1938, by which time he had achieved 92 victories. He lost 26 matches, and another 15 ended in ties. Despite growing anti-Semitism, Perez continued living in Paris, and even travelled to Berlin for a match in November 1938. When France was defeated by the Germans in 1940, Perez attempted to flee together with a friend, but returned. On September 21, 1943, weeks before his 31th birthday, Perez was arrested by the Gestapo. He was sent to the Drancy concentration camp in France together with 1,000 prisoners – and then on to Auschwitz. He was forced to perform manual labor and to participate in boxing matches to entertain the Nazis. The Germans allowed Perez to train at first, but after a match against an SS member he was subject to treatment similar to that of the other prisoners. On January 22, 1945, Perez was shot dead by a Nazi soldier during the death march from the camp. He was 35 years old. Perez was inducted into the International Jewish Sports Hall of Fame in 1986. A film called "Victor Young Perez", based on his life, was screened at festivals in 2013.